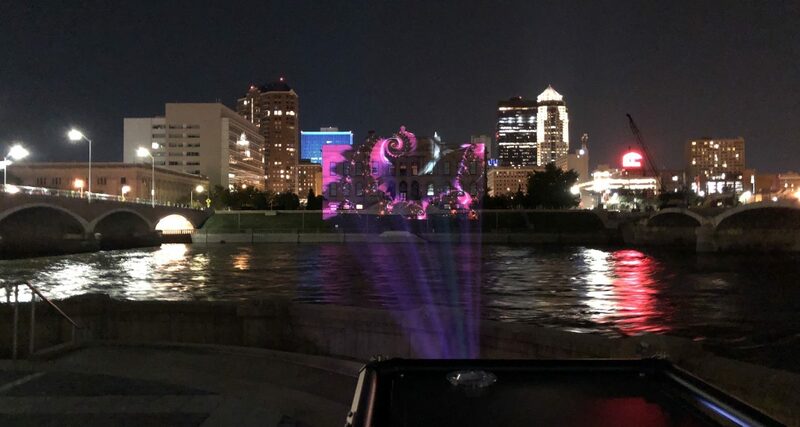 Greater Des Moines Public Art Foundation organized and funded the October 14 and 16, 2018 presentation, with in-kind support from CLE Productions, Ruan Transportation Management Systems, Inc., and The World Food Prize Foundation for access to the east facade of Hall of Laureates. To see and experience this dramatic public art project captures the essence of the transformational experience. Embodying artistic traditions of teamwork to unparalleled extents, Oyoram’s Mental Banquet: Painting with Lights (2018) celebrates both the triumph of technology and the splendor of our natural world. The artist has honed his aesthetic from nature’s formal beauty and exuberant ornamentation, as well as architectural space. His art expresses the acts of going, growing, changing, and the processing of time. 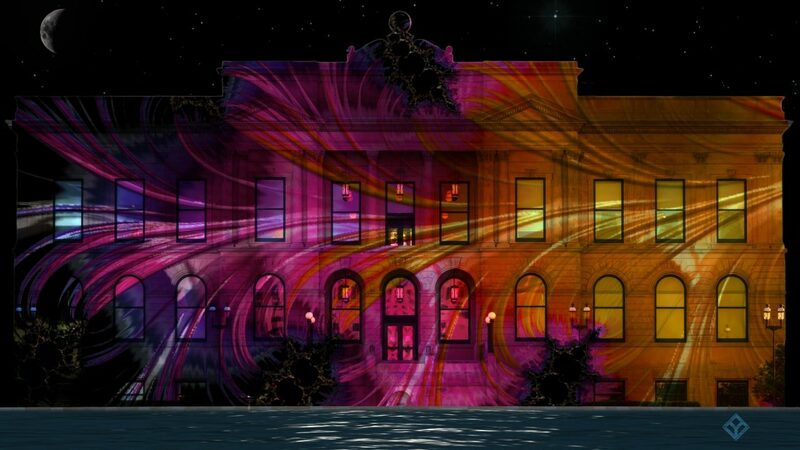 detail: Mental Banquet: Painting with Lights, 2018, Architectural mapping projection on the east façade, Hall of Laureates, Des Moines, IA, approx. 72 x 164 feet (22 x 50 meters); Courtesy of the artist. 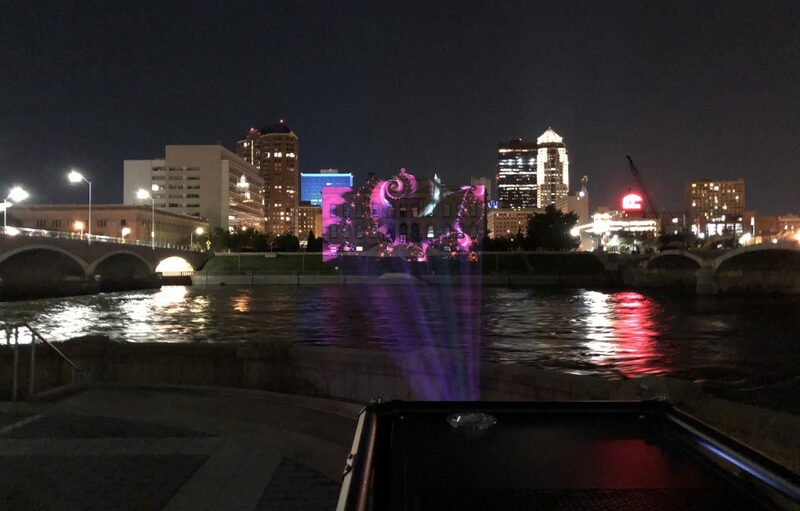 The Greater Des Moines Public Art Foundation is deeply grateful to Oyoram for all of his efforts and collaborations in creating this project. The artist developed the music score in collaboration with Rhakeem Alpoe (aka Shaquille Phillips), Jack Gallup and Melvin Veach. 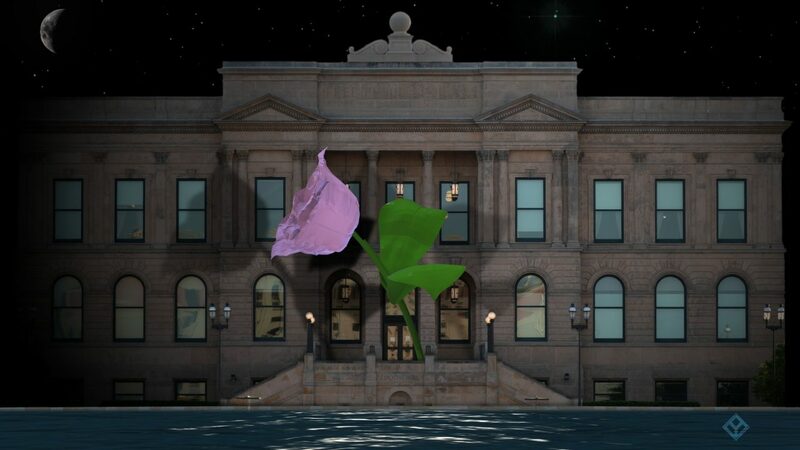 The projection mapping performance on the facade of this Beaux-arts building in downtown Des Moines was a formidable effort. The dimensions of Mental Banquet: Painting with Lights— approximately 72 x 164 feet (22 x 50 meters) — are the same dimensions of the east facade of the Hall of Laureates.